Hotel Forum Fitness Spa & Wellness Lublin is a modern facility located in the centre of Lublin, ideal for those who value cosiness, peace, and comfort. The convenient location makes it easy to explore the city and the most beautiful historic sites. The oldest part of Lublin – the Old Town is located in close proximity of the Hotel. The Castle with the Castle Chapel, Lublin Cathedral and Trinitarian Tower, as well as Teatr Stary (Eng. Old Theatre) are just some of the places that are worth seeing while walking along the historic townhouses. 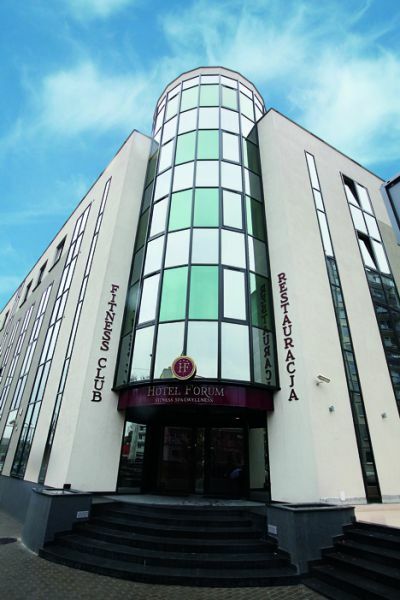 Hotel Forum Fitness Spa & Wellness Lublin is a great place for both business and private parties. The Hotel in Lublin offers its guests 30 rooms equipped to a high standard. Each of these rooms has been designed to provide the best environment for effective work and leisure. We organize trainings, conferences, wedding receptions as well as other celebrations with family and friends. The chef of the Forum Fitness Spa & Wellness restaurant recommends exquisite dishes that will satisfy even the most demanding guests. The Hotel features Spa & Wellness area which renders it an extremely attractive facility. Guests of the Hotel and those from outside can relax in the relaxation area, spend their active time in the gym or enjoy soothing body treatments and relaxing massages. Forum Fitness Spa & Wellness Hotel Lublin is the winner of the Top Hotel Award in Sport & Fitness category.